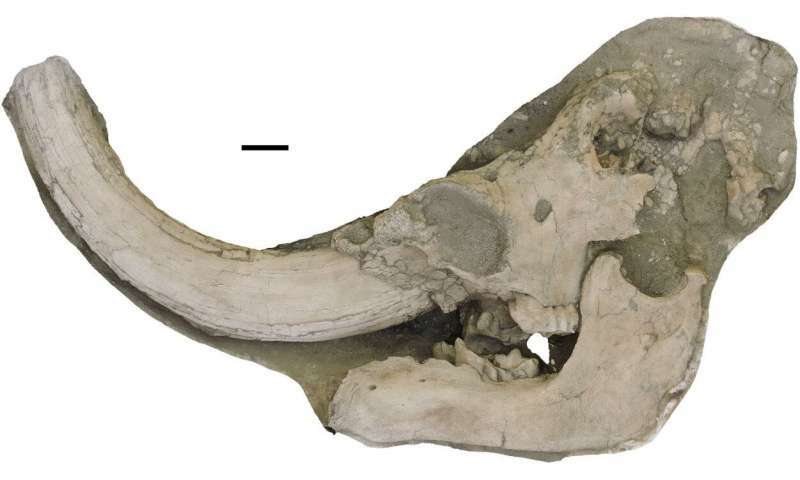 Left side view of a skull of Mammut pacificus, from Dooley et al. 2019. A team of researchers affiliated with several institutions in the U.S. has discovered a new species of mastodon. In their paper uploaded to the peer-reviewed journal PeerJ, the group describes discovering the new species and why it has only just been found. Mastodon were large animals that resembled modern elephants. They existed during parts of the Miocene and Pleistocene epochs, and were related to mammoths. They have been extinct for approximately 3000 years. Scientists have known of their existence for approximately 200 years—and they have been studied extensively, which makes the discovery of a new species very much a surprise. The new discovery did not come about due to a new dig—indeed, the bones that gave evidence of the new species have been held in several museums throughout California for over 20 years. The discovery was accidental—some of the team members were doing a study of mastodon teeth and found differences between the samples in California and those that were from other parts of North America. Those in California had molars that were smaller and less wide compared to those from mastodons in other places. 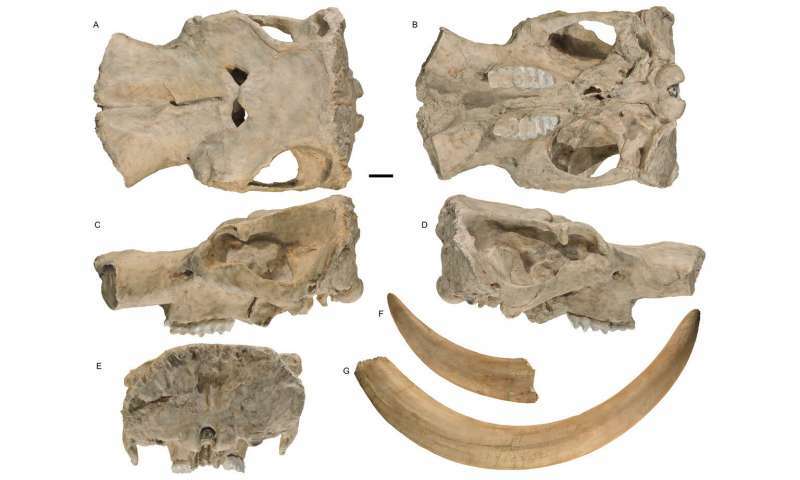 This finding prompted the team to take a closer look, which revealed that the specimens also had more vertebrae, lacked a lower tusk and had femurs that were somewhat different. The California fossils were found at Diamond Valley Lake in the 1990s, where 100,000 skeletal fossils were unearthed—the area is now covered over by an emergency water reservoir, so it is unlikely that more will be found. The researchers note that in addition to the obvious physical differences, there is evidence that the animals living in California were isolated from other species for thousands of years, and that they lived during the Pleistocene. They suspect there are also genetic differences. The researchers claim that the cumulative evidence strongly points to the discovery of a new species, making it the first new North American mastodon species reported in 50 years. Other researchers will have to review the work and conduct studies of their own before the new find can be officially recognized as a new species: Mammoth pacificus. "They have been extinct for approximately 3000 years..."
"inhabited North and Central America during the late Miocene or late Pliocene up to their extinction at the end of the Pleistocene 10,000 to 11,000yrs..."
"Mastodons (Greek: μαστός "breast" and ὀδούς, "tooth") are any species of extinct proboscideans in the genus Mammut (family Mammutidae), distantly related to elephants, that inhabited North and Central America during the late Miocene or late Pliocene up to their extinction at the end of the Pleistocene 10,000 to 11,000 years ago..."
"All known Pleistocene Mammut remains from California are consistent with our diagnosis of M. pacificus, which indicates that M. americanum was not present in California"
"During the American megafaunal extinction event around 12,700 years ago, 90 genera of mammals weighing over 44 kilograms became extinct." -so that M. pacificus was the only megafaunal animal left alive for over 9,000 years? All those textbook numbers from the 80s are likely to be quite invalid. Much like a lot of the other science aside from electrical from those times. What makes you think ALL those 'textbook' numbers are from the 80s and havent been validated since? Im looking at the refs from the page I got these numbers from and most all are from the last 20 years. actually, I am just reiterating what the study stated, which is why I very specifically included the phrase "per the study"
"In recent decades, our knowledge of mastodon anatomy has made strides (Green, 2006; Fisher, 2008, 2009; Hodgson et al., 2008a) as has our understanding of their disappearance within the context of the late Pleistocene extinction of the North American megafauna..."
-which occurred at least "10,000 to 11,000 years ago..." and not 3000. "Mastodons are any species of extinct proboscideans in the genus Mammut (family Mammutidae)"
"...disappeared from their mainland range at the end of the Pleistocene 10,000 years ago [but] isolated populations survived on St. Paul Island until 5,600 years ago and on Wrangel Island until 4,000 years ago..."
-So who knows? Isolated hippie communes exist in the wilds of CA to this very day.